The studies on colloidal silver below are for informational purposes only. They are intended for our customers and visitors to gain a better understanding of how silver in various forms works. We do not make any claims that our product treats or cures any disease as the FDA has not evaluated the statements and products on our site. However, silver has a long well-known history of thousands of years as a natural antibiotic and food preservative that is unquestioned. 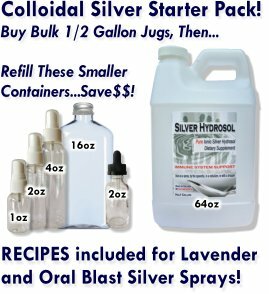 Colloidal silver is simply a more efficient way to obtain silver ions in our diet vs. relying on exposure to silver utensils, plates, bowls, pitchers, etc..., as in the past. So we hope you enjoy these articles as much as we have! If you have any articles you would like to submit to our site, please do so using the submission form below! We also would love to hear your testimonials. 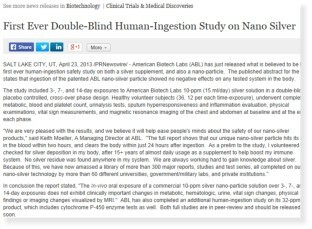 Rice University Study "Ions, not particles, make silver toxic to bacteria"
This article highlights that studies on colloidal silver often don't get the expected results! 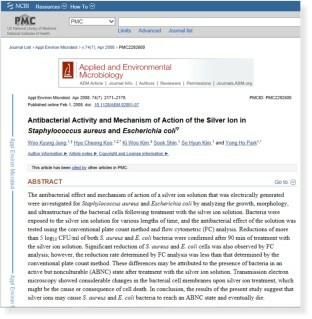 The conventional wisdom had been that silver ions are toxic to bacteria. They proved that to be true. What they didn't expect was to learn that contact with nano-sized particles of non-ionic silver did NOT kill the same bacteria! They found out that it is ions released from these particles that kill bacteria. If ions don't get released, they found these particles to have no effect on bacteria. Around the internet, you'll often see silver ions slammed as useless. The science doesn't support that claim at all. 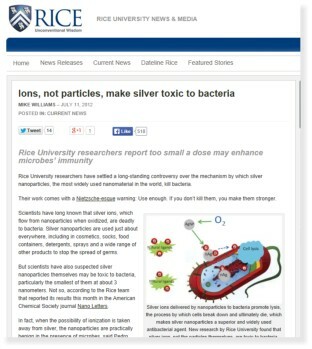 To read the entire Rice University article about silver ions vs. silver particles please click here. 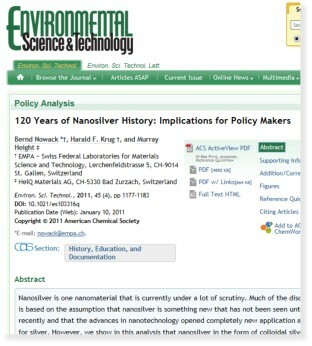 "Nanosilver is one nanomaterial that is currently under a lot of scrutiny. Much of the discussion is based on the assumption that nanosilver is something new that has not been seen until recently and that the advances in nanotechnology opened completely new application areas for silver. 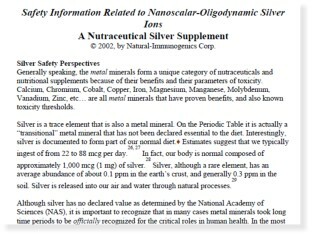 However, we show in this analysis that nanosilver in the form of colloidal silver has been used for more than 100 years and has been registered as a biocidal material in the United States since 1954. 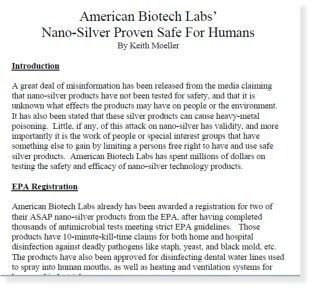 Fifty-three percent of the EPA-registered biocidal silver products likely contain nanosilver. Most of these nanosilver applications are silver-impregnated water filters, algicides, and antimicrobial additives that do not claim to contain nanoparticles. Click here for the report. This is an excellent paper for many reasons. It's ironic that silver has such a well-known reputation throughout all of recorded history yet is often met with institution resistance that defies common sense! It's akin to organic farmers being required to pay fees and have numerous inspections and tests in order to simply produce a natural product while the GMO industry gets a pass. Particularly helpful is a FAQ section, where our most common concerns are answered. Safety Information Related to Silver Ions - Excellent Read! This white paper is an excellent read as their product also is pure ionic (Ag+). The Engineer and Researcher, Fred Peschel, created our manufacturing process, delivering a pure ionic silver product. Peschel know that regardless of what form of silver exists, whether it be silver sulfide, silver nitrate, silver chloride, etc...., it was actually the ions released for any of these forms that did the work. So he invented a process that just produced ions. That's why our product is colorless and clear. It's just ions! Some highlights from this study on silver ions.....click here for the full study. "Since ancient times, the silver ion has been known to be effective against a broad range of microorganisms. Today, silver ions are used to control bacterial growth in a variety of medical applications, including dental work, catheters, and the healing of burn wounds"
"The silver ion can be generated by electrolyzing the silver metal or dissolving the silver compounds. It is known that the electrically generated silver ion appeared to be superior to the silver compounds in antimicrobial activity"
Silver nanoparticles inhibit hepatitis B virus replication. "Silver nanoparticles have been shown to exhibit promising cytoprotective activities towards HIV-infected T-cells; however, the effects of these nanoparticles towards other kinds of viruses remain largely unexplored. The aim of the present study was to investigate the effects of silver nanoparticles on hepatitis B virus (HBV)." 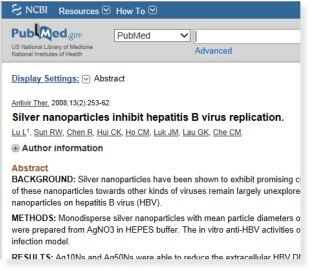 "Silver nanoparticles could inhibit the in vitro production of HBV RNA and extracellular virions. We hypothesize that the direct interaction between these nanoparticles and HBV double-stranded DNA or viral particles is responsible for their antiviral mechanism." Click here for report. Digestion and absorption of silver ions begins in the mouth! Metallic ions, either free or disassociated from dissolved soluble salts are both absorbed sub lingually and/or isolated by ligands in the saliva, usually metalloproteins. (The main reason you are meant to chew your food well). Metallothionein (MT) is a relatively small molecule that binds heavy metals including silver, cadmium, iron, copper and zinc, and is made by most cells in our body. Your saliva has over 200 different proteins and fully one third of body proteins are metalloproteins I.E. carrying metallic ions. Thus, reactive ions (missing one or more electrons) can be transported past the stomach and thru the circulatory system without local reactions. Metal ion substitution permits even a zinc metalloprotein to take up the silver ion and release the zinc ion. The free, ionized zinc, which would be toxic if permitted to accumulate, binds to a metal regulatory element on the promoter region of the metallothionein gene and "turns on" the synthesis of more metallothionein. Ion channel formation "Transmembrane ion transport, a critical process in providing energy for cell functions, is carried out by pore-forming macromolecules capable of discriminating among very similar ions and responding to changes in membrane potential. It is widely regarded that ion channels are exclusively proteins, relatively late arrivals in cell evolution. " "We are very pleased with the results, and we believe it will help ease people's minds about the safety of our nano-silver products," said Keith Moeller, A Managing Director at ABL. "The full report shows that our unique nano-silver particle hits its apex in the blood within two hours, and clears the body within just 24 hours after ingestion. As a prelim to the study, I volunteered to be checked for silver deposition in my body, after 15+ years of almost daily usage as a supplement to help boost my immune system. No silver residue was found anywhere in my system." Thanks for reading these studies on colloidal silver! We hope these studies on colloidal silver have broadened your understanding of this precious gift of nature! Of all commodities, silver ranks #2 for the number of uses it has in our lives....over 10,000 of them! Only petroleum oil has more uses. These only represent a small fractions of all the studies on colloidal silver available. More will be added in the future!